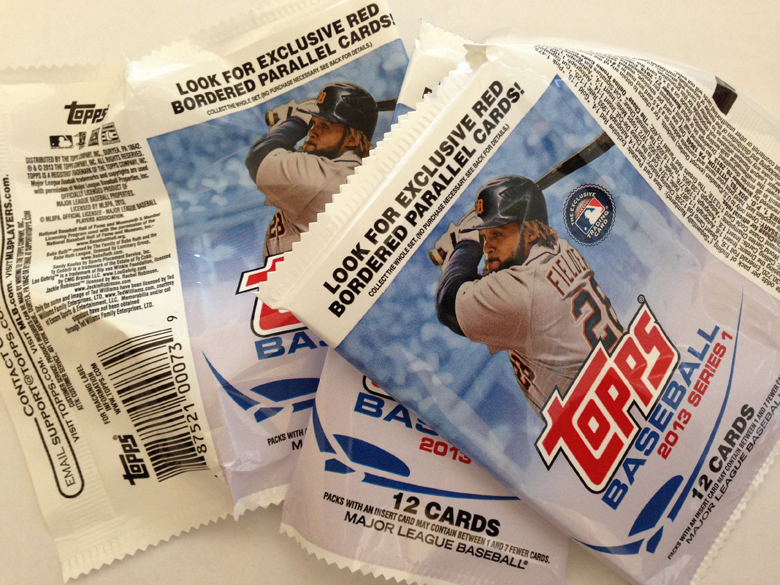 Before you even look at your cards, make sure you DO NOT throw those wrappers in the trash. You will want them for this year’s Silver Slate wrapper redemption program. And every wrapper counts, retail and hobby. 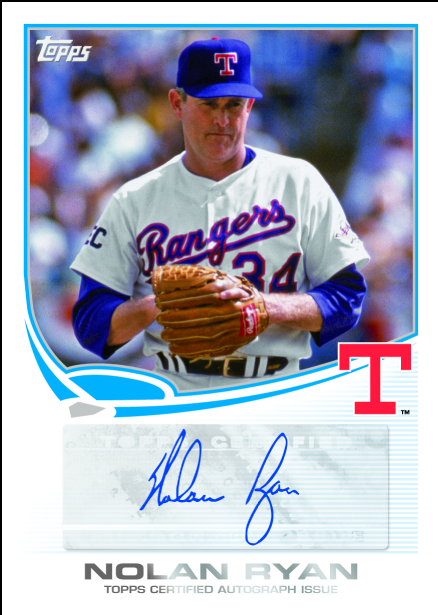 In addition to the 330 cards available, bonus autographed cards have been randomly inserted into packs and feature the likes of Cal Ripken Jr., Ken Griffey Jr., Nolan Ryan, Tony Gwynn, Manny Machado and Dylan Bundy. 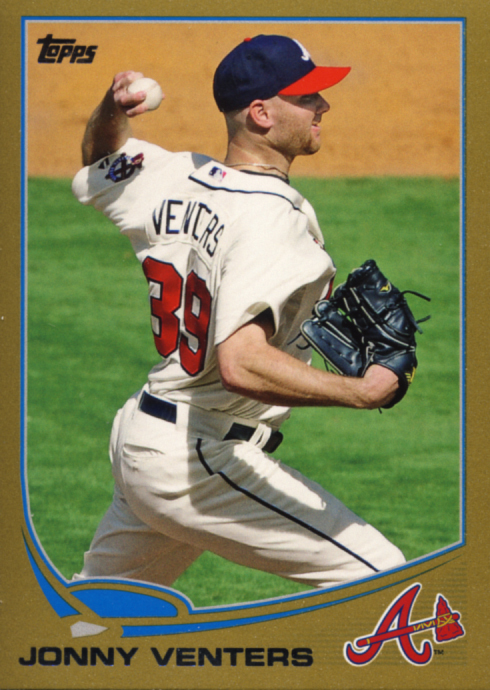 Now that you’ve put your wrappers to the side, let’s take a look at the cards. 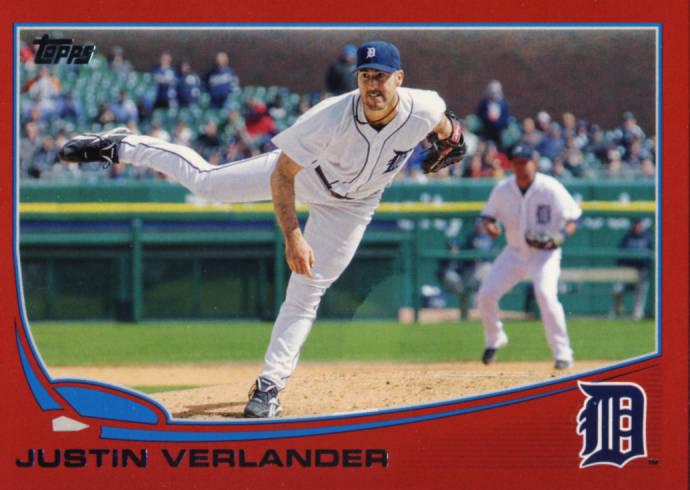 This year’s release of Series One has the usual 330 base cards, but in an unusual configuration. 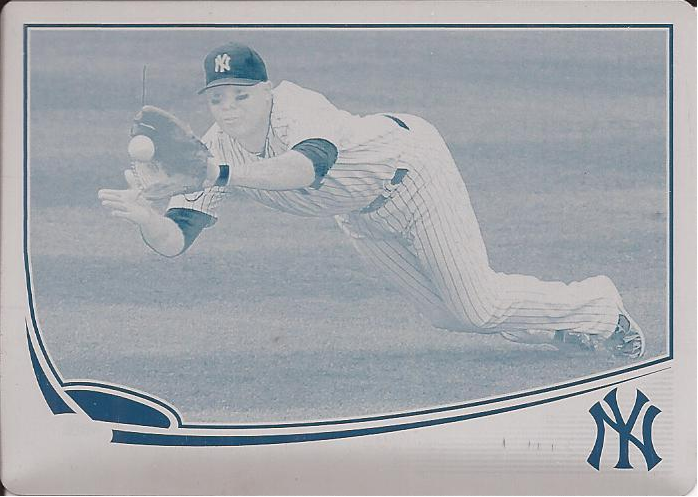 Gone is card number 7, that has been dedicated in past years to Mickey Mantle, so collectors who are hand collating their sets should be prepared to skip from card number 6 to card number 8 for now. Topps has made no indication whether or not there will be a Mickey Mantle card # 7 in 2013 to chase. 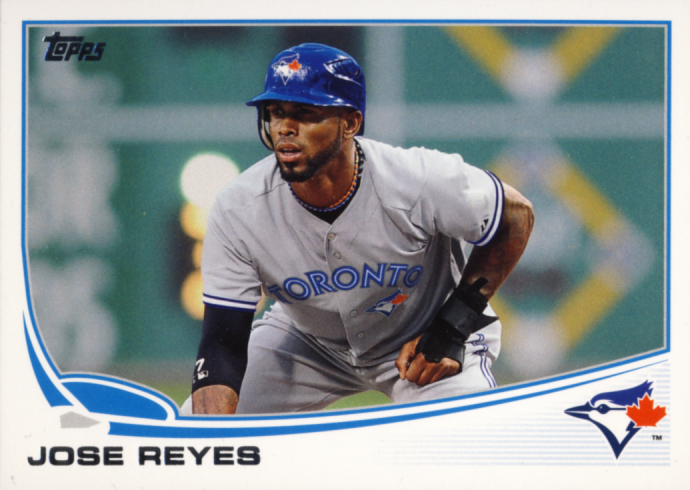 To keep the base set 330 cards, Topps has added card #331, which is Jose Reyes. Unlike prior releases of Series 1, card #331 is not a short print and will not be re-released in Topps Baseball Series 2. Desert Camo #/99, Pink #/50, and Platinum cards that are 1/1. 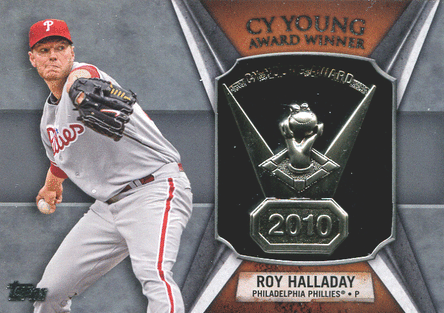 Black cards #/62 and 1/1 Printing Plates can be found exclusively in Hobby boxes. There are Base Set photo variation short prints to be found. 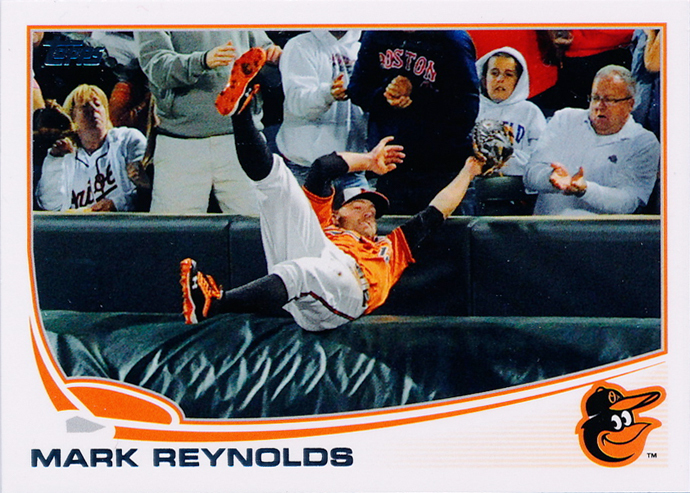 These cards are referred to as the Out of Bounds SP as the photos feature players chasing foul balls. There are 25 in total. 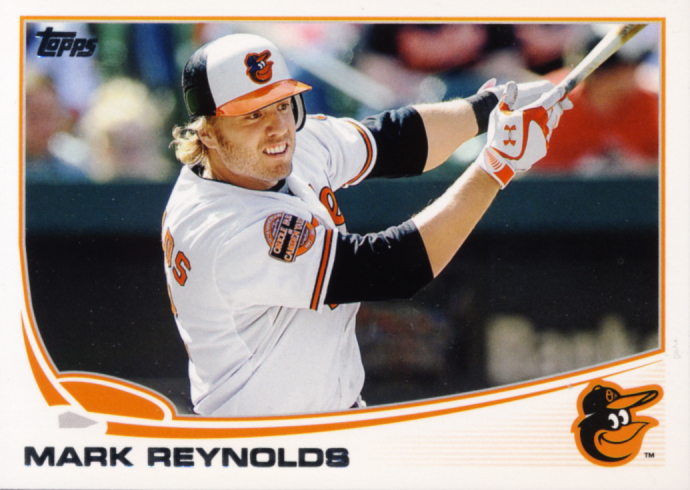 Bryce Harper, Brett Lawrie, Paul Konerko, Andre Ethier, Kevin Youkilis, Mike Trout, Anthony Rizzo, Todd Frazier, Mike Moustakas, Freddie Freeman, Joe Mauer, Mark Reynolds, Andrew McCutchen, Buster Posey, Eric Hosmer, Alex Gordon, Alex Rodriguez, Josh Willingham, Matt Kemp, Russell Martin, Rajai Davis, Cameron Maybin, Albert Pujols, David Wright, and Jay Bruce. 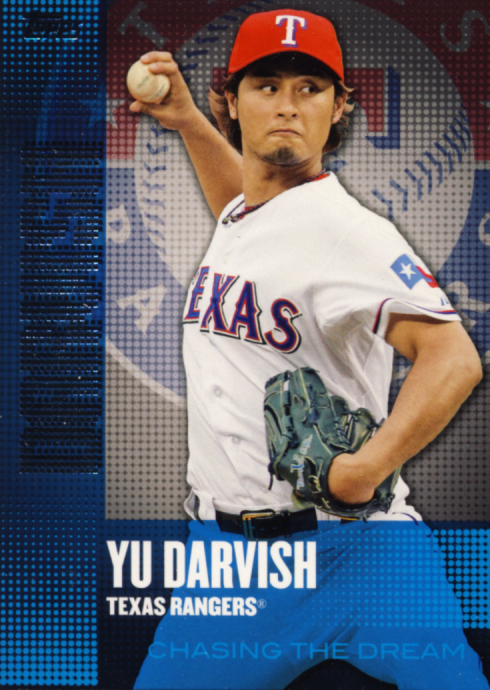 There are also Base Set Autograph SP cards. 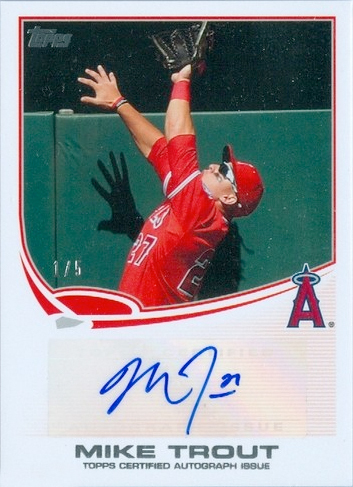 The first one to show up was Mike Trout and it was numbered to #/5. 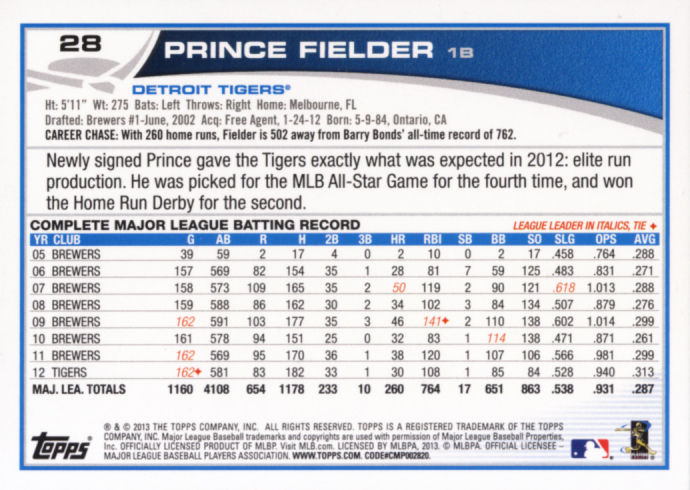 The other players with these cards are Andre Ethier, Buster Posey, Cameron Maybin and David Wright. 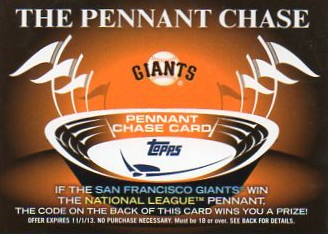 As in past years, this year’s release has a theme, “The Chase.” This theme is carried through to most of the inserts and promotions found in Series 1. 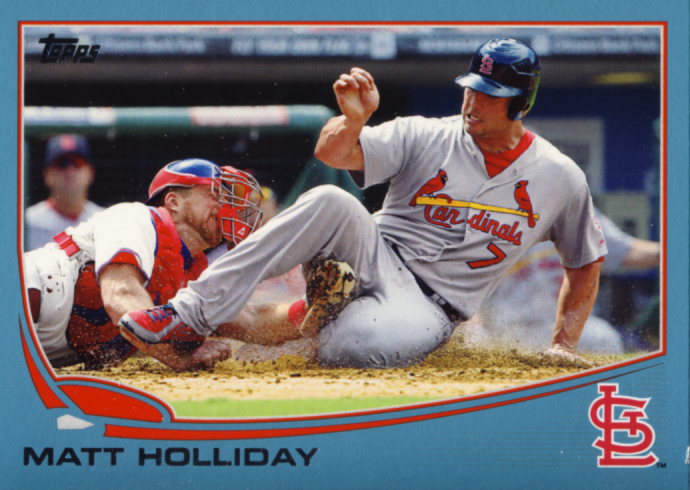 As usual, there are plenty of inserts and hit cards. 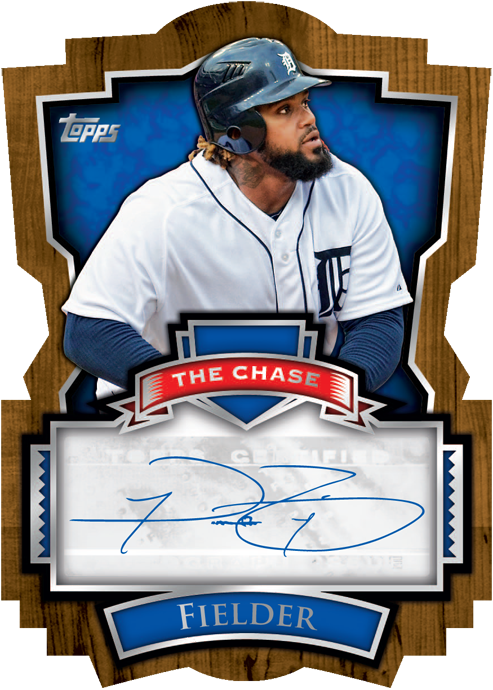 Here are the "Chase" themed inserts and hits. 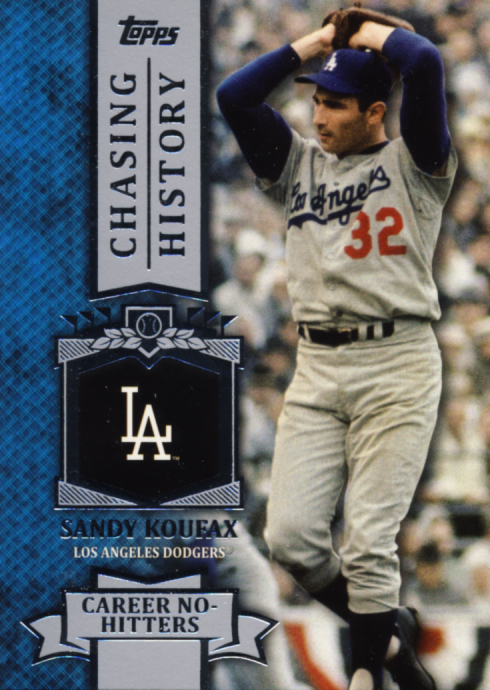 There are retail exclusive gold parallels of the Chasing History inserts. 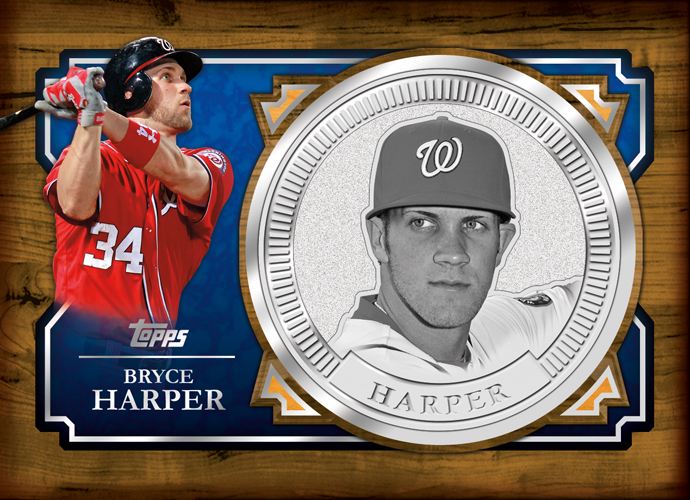 All three of these inserts can be found in regular, relic, autograph and Hobby Exclusive auto/relic variations. 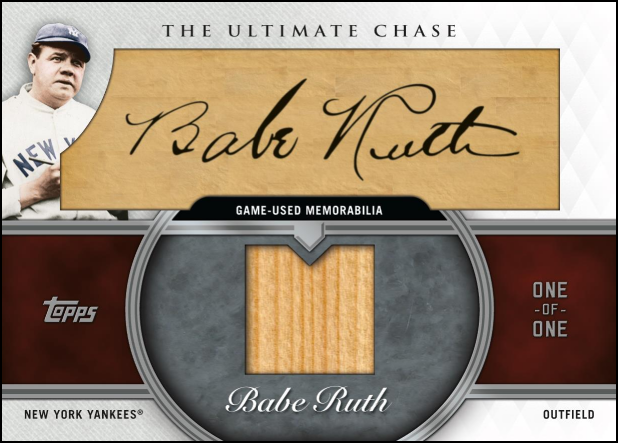 There are also Chasing History Cut Autos that are 1/1. 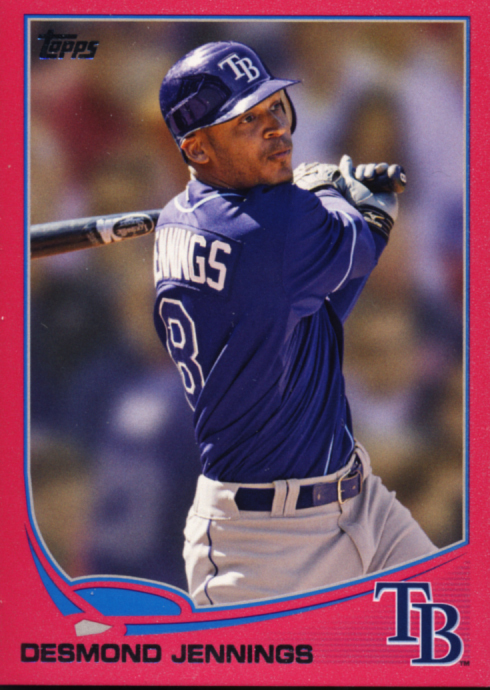 These should be the most prized cards to be pulled from Series 1 and they can be found in both retail and hobby as redemptions. The entire set consists of thirty 1/1s. 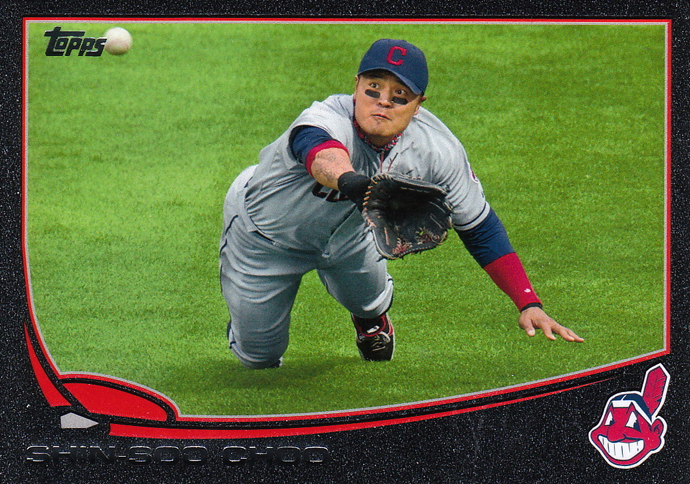 Each card in the set is individually designed and constructed. 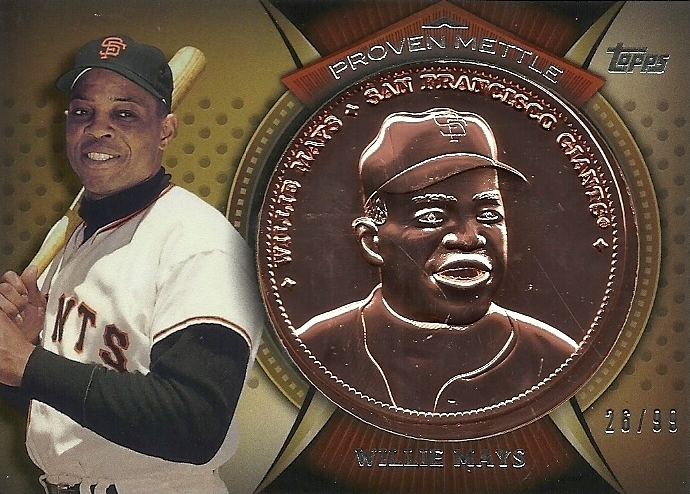 They feature a relic like a bat knob, name plate or a jumbo patch and either an autograph or a cut signature. 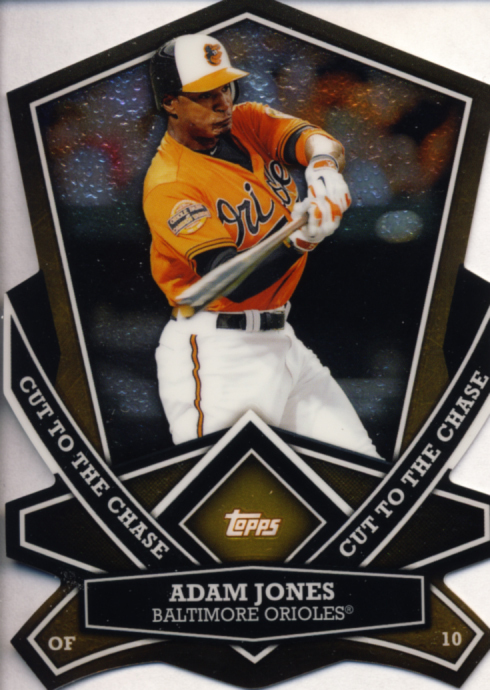 Here are the other inserts and hits that are not chase themed. 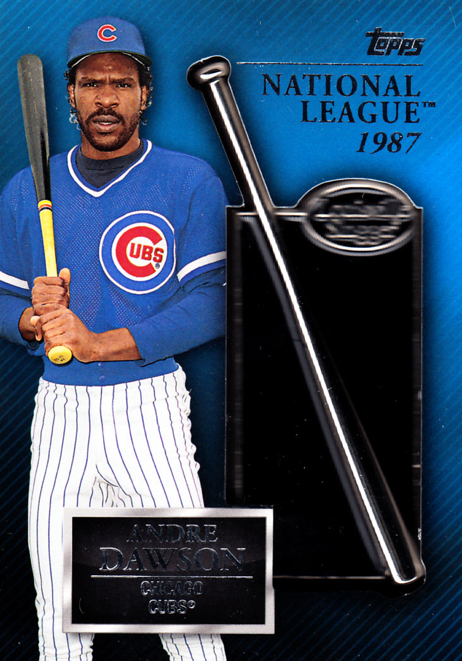 Both of these come in relic and autograph versions. 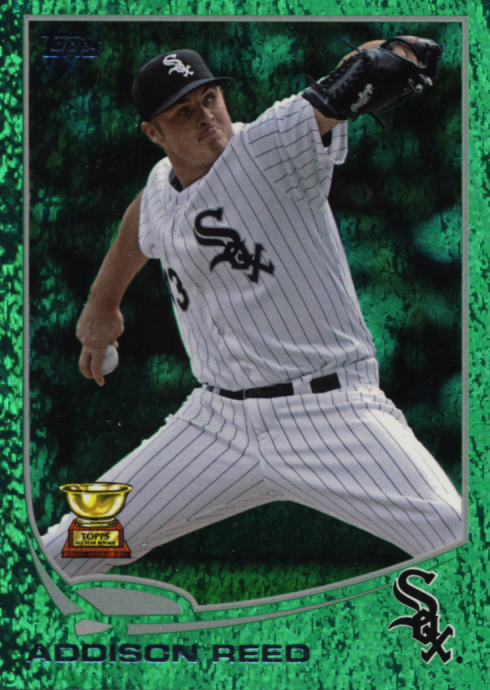 The Calling Cards also have Hobby Exclusive auto/relic variations. 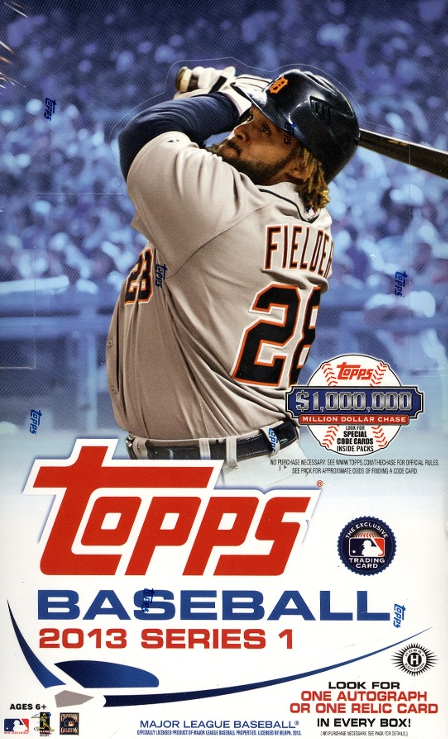 Of course, all of the autograph cards feature some of the biggest names in baseball including Johnny Bench, Reggie Jackson, Stan Musial, Hank Aaron, Duke Snyder, Sandy Koufax, Rickey Henderson, Nolan Ryan, Gary Carter, Ken Griffey Jr., Cal Ripken Jr, Jose Bautista, Mike Trout, Bryce Harper, and Yu Darvish. 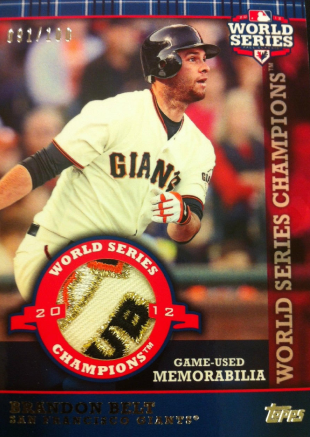 World Series Champions featuring players from last year's San Francisco Giants are only available in hit versions. Relic, autograph and auto/relic. 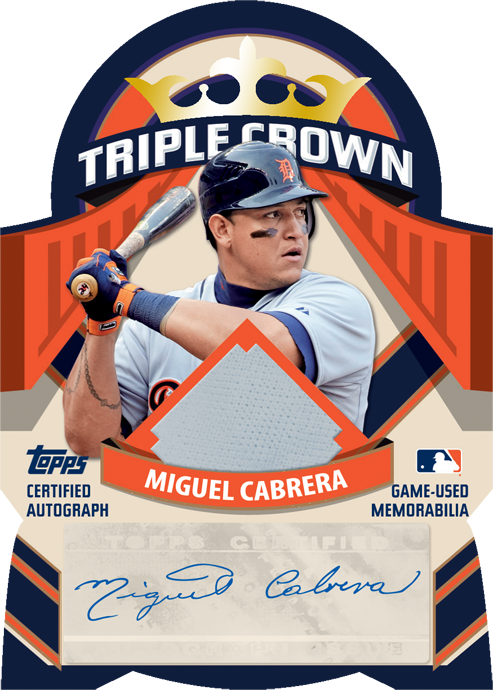 Triple Crown Die Cut cards celebrating Miguel Cabrera's achievement last year come in 10 different varieties and in two different versions, relic and auto/relic. Currently these can be found in packs as redemptions. 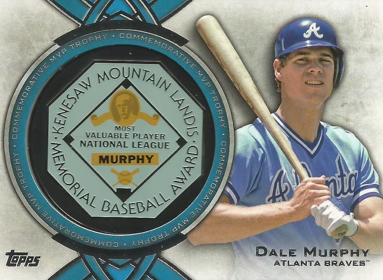 The Greats is a hobby exclusive insert that can be found as a regular insert card, Gold #/99 and Ruby #/50 parallels as well as relic #/25, autograph #/10 and auto/relic #/5 variations. 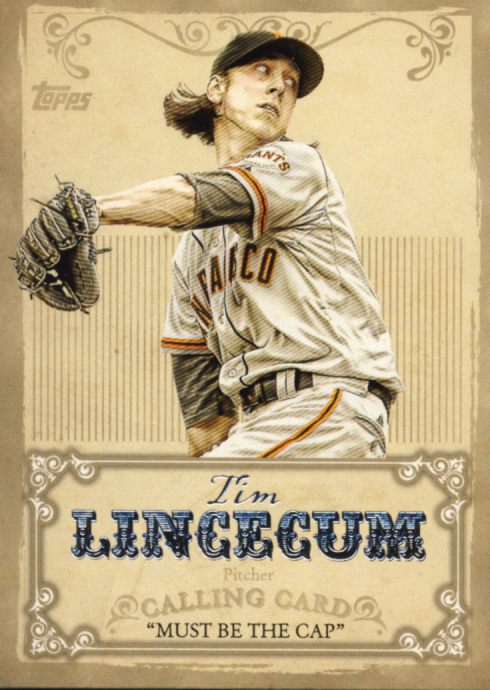 In The Name relics feature 1/1 cards cut from the nameplates of the players chosen to play in last year's All-Star Game. 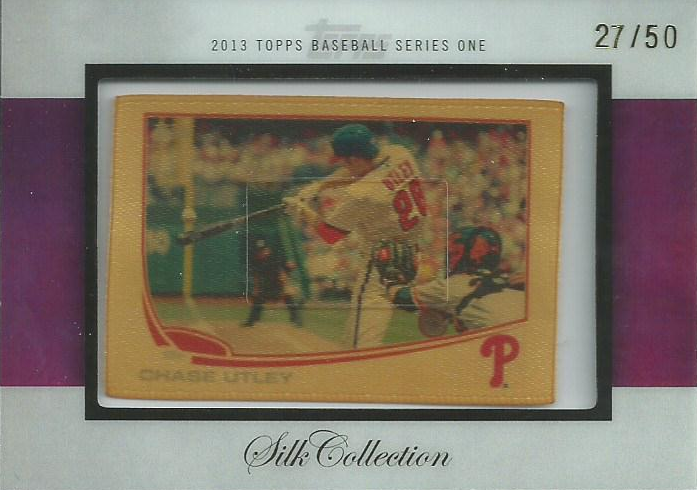 The Silk Collection cards return this year and, once again, are numbered to 50. 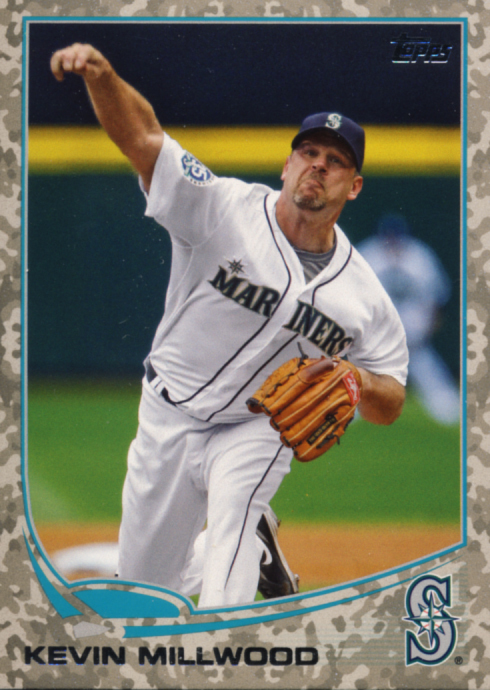 Also returning this year are Manufactured cards. 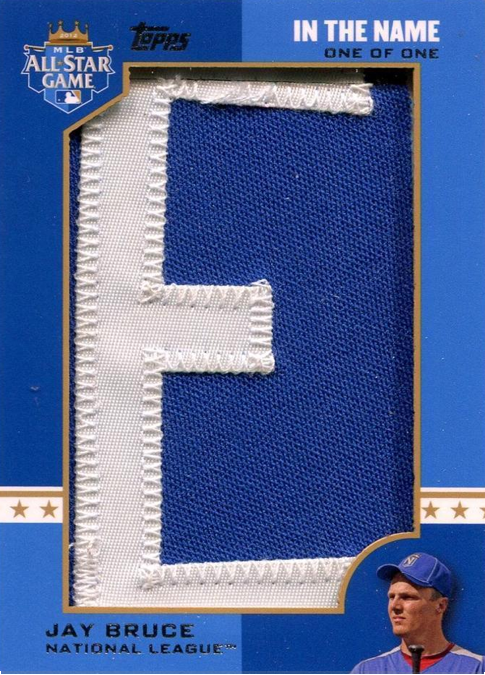 These were a big hit last year with items like World Series rings. Here is what is you can find in 2013. 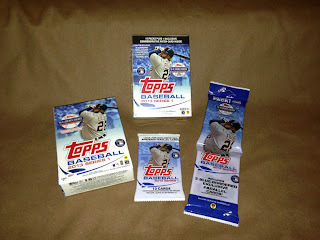 These are Retail Blaster exclusives and feature manufactured team patches and rookie reprint patches. 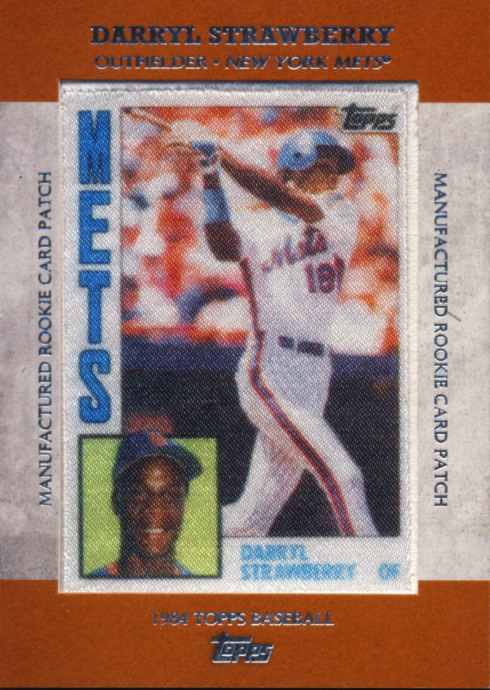 The rest of the Manufactured Cards are Hobby exclusives. These are all THICK cards with manufactured relcis embedded in them. Only the Proven Mettle are numbered. Copper #/99, Wrought Iron #/50 and Steel #/10. Also returning to Series 1 this year are various promotions. 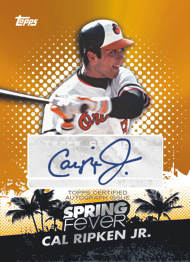 Special Spring Fever Redemption cards are randomly inserted into packs of Series 1 and can be redeemed for an exclusive 5-card promo pack of Topps Spring Fever baseball cards at participating hobby stores during the first week of Spring Training, February 20th-February 27th. 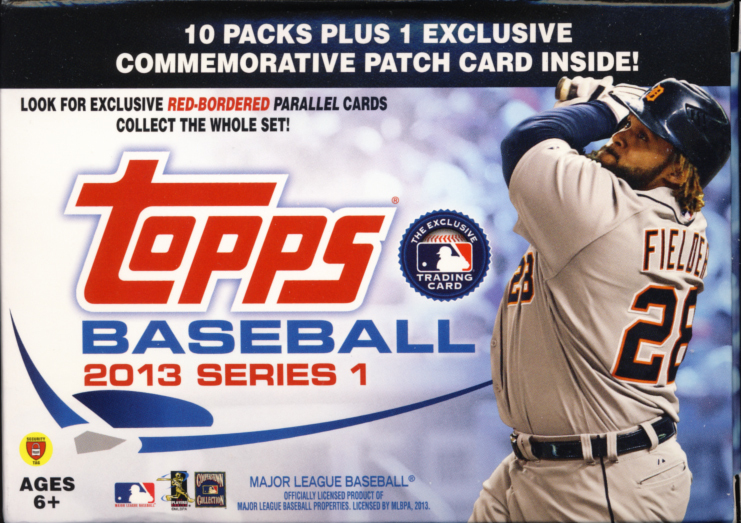 And some of those packs will include exclusive autographed cards. 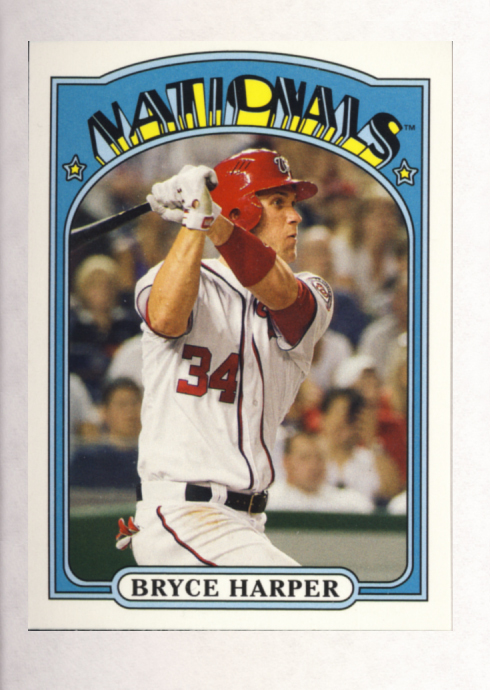 Topps has randomly inserted 10 Ultimate Chase Tickets in hobby boxes of Baseball Series One. Collectors who find these tickets will receive an authentic autographed bat signed by 5 current or retired players. 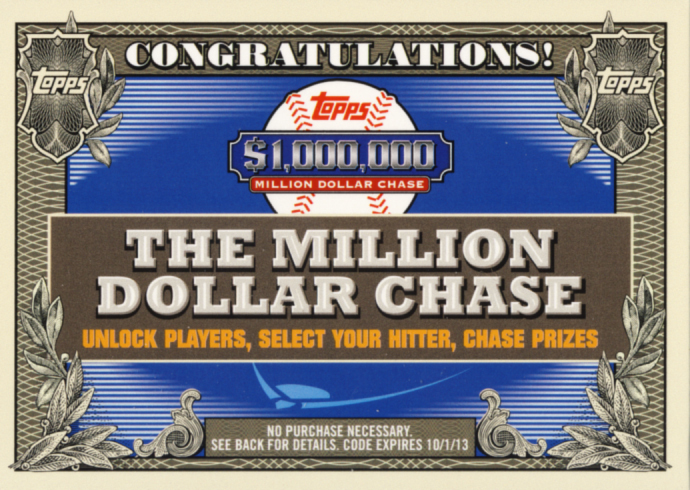 All ten of those tickets will provide a chance for one lucky collector to win the grand prize, the Ultimate Chase Pass. 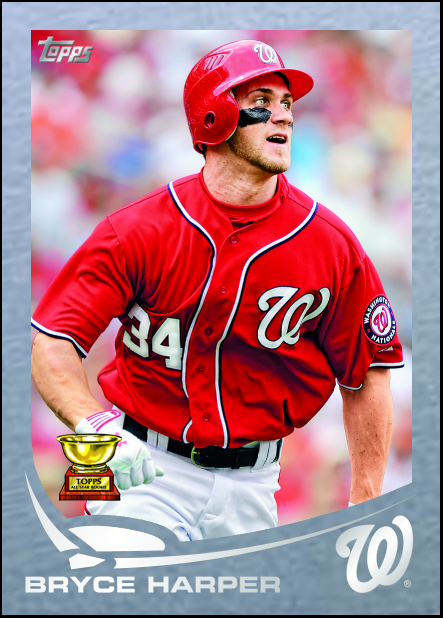 The pass will allow that collector to join the chase of a 2013 MLB Playoff team as they progress through the playoffs. 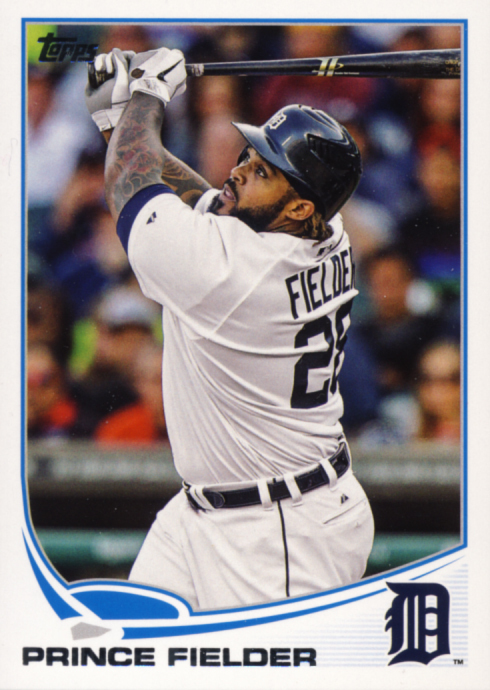 Collectors who are lucky enough to pull these cards will have to wait until the end of the of the season in hopes that the team on their card will move on to the MLB playoffs. 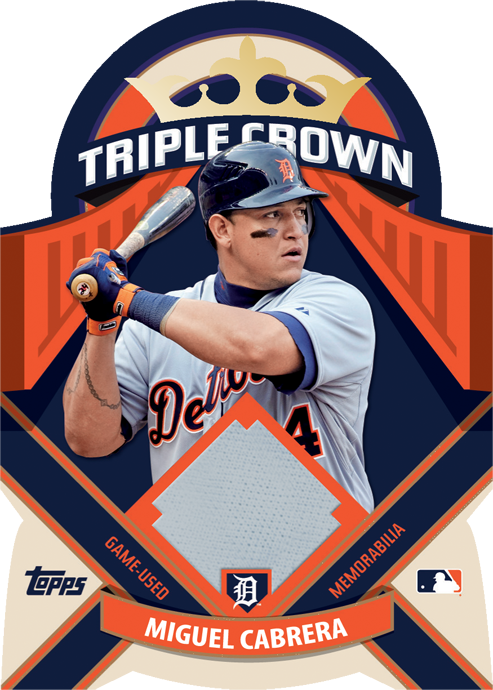 If the team on your card wins their league's pennant, you win a prize, which according to a tweet by Topps, is a special made patch card. 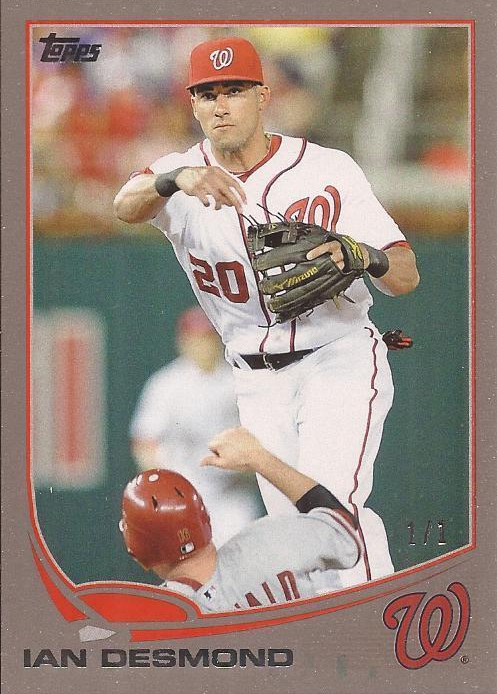 So now you know about the cards in 2013 Topps Baseball Series One. Here are the packing configurations. These will be found at your bigger stores. 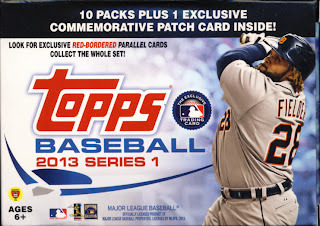 At the top is a blaster which contains 10 - 8 card packs and 1 of the Commemorative Patch Relics or Commemorative Rookie Patch Relics cards. 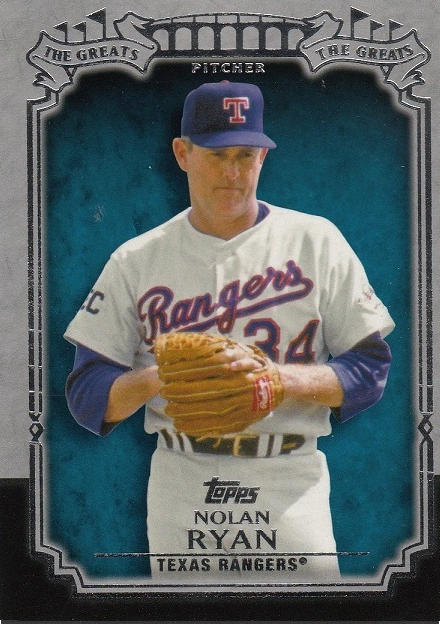 Short of the secondary market, retail blasters are the only way you will be able to get these cards. To the left is a hanger pack. This contains 1 - 72 card cello pack that has a nice group of inserts and at least one Million Dollar Chase code card sandwiched between a bunch of base cards. To the extreme right is a Jumbo (sometime referred to as a rack) pack. This contains 36 cards. In the middle is a single pack of 12 cards. While not confirmed, later in the year we expect to see other retail configurations such as multipack blisters with a visible Million Dollar Chase code card and probably value boxes with multiple packs of Series 1 mixed with another Topps Baseball release such as Heritage Hobby packs. When they become available, we will let you know. 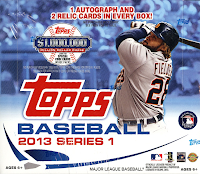 These boxes can only be found at your local hobby shop and from reputable online trading card sellers. To the left is a Hobby box that contains 36-10 card packs. Each Hobby box contains 1 Autograph or Memorabilia card. To the right is a Jumbo HTA box. It contain 10-50 card packs. It also contains 1 Autograph and 2 Relic cards. You can also buy factory cases of these hobby boxes. Hobby cases contain 12 Hobby boxes and Jumbo cases contain 6 Jumbo HTA boxes. 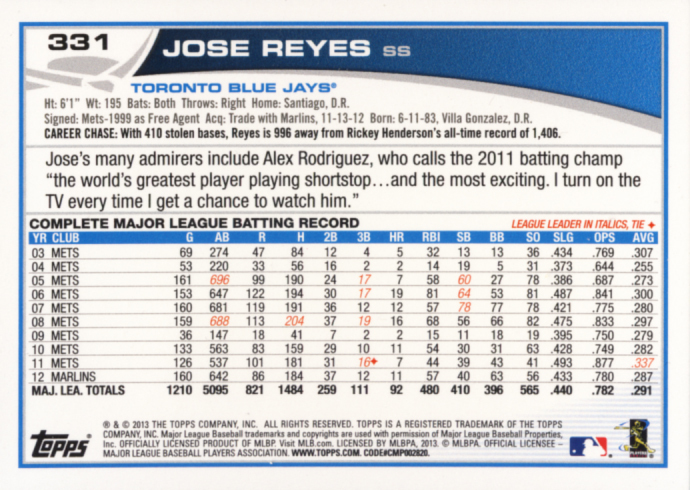 And that is everything you need to know about 2013 Topps Baseball Series 1. As new information becomes available, we will update this post. I already threw away 40 retail wrappers. Dang it. Very compreshensive and informative! Thanks! i LOVE your "everything you need to know" posts! thanks!